We are on the last two months of school. We still have a lot of learning to do! Please ensure kids are on time and that we limit the number of early check outs each students do. Also our lost and found is over flowing please come in and check it out. Also we have started planning end of the year field trips. Make sure to check planners for information. We also collect Labels for Education, so save them and send them in with your Box Tops. 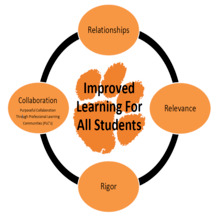 The Lydia Rippey Elementary Staff will collaborate with colleagues to ensure student success, teach the adopted curriculum with rigor and relevance, and foster positive relationships with our students. April 29th trough May 10th will be registration. We will start at 9:00 am until 2:00 pm. You will need to bring birth certificate, shot record, and proof of residency. We have a community cupboard set up at Lydia Rippey!!! This is a cupboard of non-perishable food to help out our community. Please leave what you can and take what you need.